Last night NYU held its first open house event since formally unveiling its epic NYU 2031 expansion plan. Not ones to roll over and play dead in the face of six million square feet (half of that in Greenwich Village) of new campus life, a crowd of preservationists, activists and neighborhood residents showed up to present a unified front in protest—but it wasn't the angry mob some may have expected. 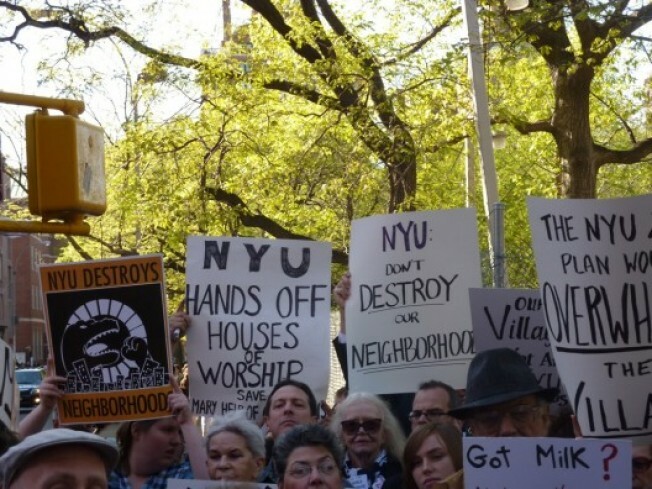 At a rally outside NYU's Kimmel Center before the event, the Greenwich Village Society for Historic Preservation's Andrew Berman chided NYU for ignoring community input, and urged the school to take a look at stalled development sites around the city instead of building new towers near Washington Square Park. NYU Williamsburg does have a certain ring to it, no? It was a more subdued affair inside the Kimmel Center, where models and posters exhibiting some of NYU's proposals for new buildings (prime targets: Greenwich Village, Downtown Brooklyn, Governors Island, First Avenue's Bedpan Alley) were spread out so attendees could casually stroll through the plan and evenly spread their rage. NYU reps were on hand to answer questions, and there were no casualties. It's clear that NYU will build (soonish! ), and it's equally clear that many people have a problem with that. What's an instituttion of higher learning to do? Pop quiz: Where is there a bunch of empty land that's both easily accessible and begging for any kind of high-rise development? Why, the World Trade Center, of course! And the Post reports today that some downtown leaders have broached the subject of NYU building one of its new 40-story towers on the site earmarked for Tower 5, the current site of the Deutsche Bank Building. The cursed plot of land has gone through several proposals, but could this crazy idea stick? Why not? Goldman Sachs employees are probably a bit less likely to pick up placards with anti-NYU slogans.